Bosch, an engineering and electronics company which operates its North American headquarters in Farmington Hills, in collaboration with TomTom, a Dutch map and traffic information provider, today announced the first radar signaled localization layer for high-resolution maps used in automated driving. 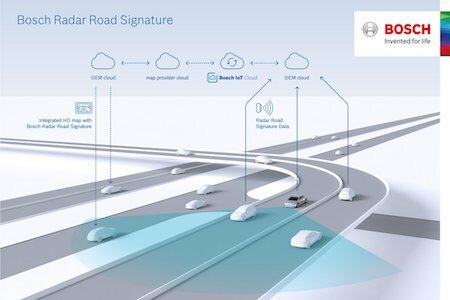 Bosch’s radar road signature is composed of billions of different reflection points, which bounce off road signs or crash barriers and construct the correct driving course. The signature allows automated vehicles to know their exact location down to a few centimeters. The radar road signature is compatible with all conventional map formats. “The radar road signature is a milestone on the path towards automated driving. It will enable automated vehicles to reliably determine their location at all times,” says Dirk Hoheisel, Bosch board of management member. Hoheisel adds that Bosch’s biggest challenge in developing the radar road sensors was adapting existing radar sensors to detect static objects in addition to moving objects (currently used in driver assistance systems like adaptive cruise control or automatic emergency brakes). Unlike maps that receive vehicle location solely from video data, Bosch’s radar road signature provides more accurate data at night or in other poor visibility situations. By 2020 at the latest, it is predicted that the first vehicles in Europe and the U.S. will provide data for Bosch’s radar road signature. To read more about Bosch’s radar road signature, click here.